life of a Gadget Geek: tech trivia - post blue status on Facebook ! tech trivia - post blue status on Facebook ! 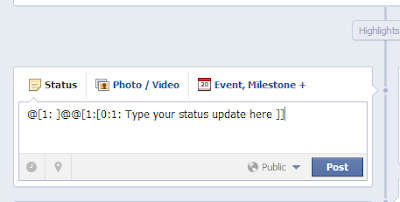 Today i am going to show you how to post a status in blue color on Facebook . Go to Facebook and Log in to your account. Then Go to status update link and then copy and paste the below code. Just replace the text with your status update and post it.It will be posted in blue color. Post your status update in blue color and attract your friends view to your status. tech trivia - reopen closed tab!